Shirts With Random Triangles: Georgia adds no. 1 RB prospect in country Zamir "Zeus" White to 2018 recruiting class. Georgia adds no. 1 RB prospect in country Zamir "Zeus" White to 2018 recruiting class. Zamir White. Image via The Charlotte Observer. 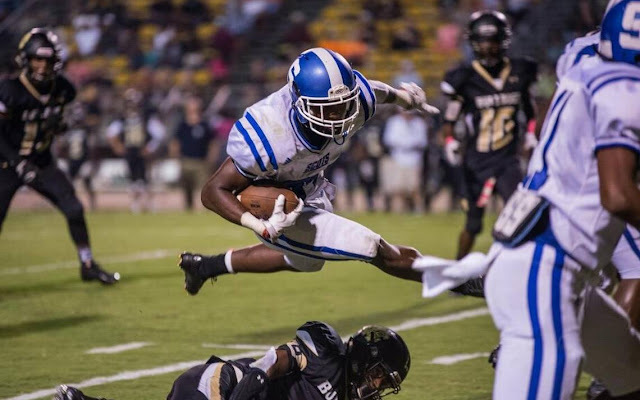 Laurinburg, North Carolina rising high school senior running back Zamir "Zeus" White, ranked by 247sports.com as the no. 1 ranked RB prospect for 2018, committed to the Georgia on Tuesday. White becomes the 7th prospect to commit to Georgia's 2018 recruiting class. 247Sports.com grades White as a composite five-star running back prospect. The recruiting site 2018 composite rankings place White at no. 1 among RB prospects, at no.1 among prospects from the state of Georgia, and at no. 6 nationally. White attends Scotland County High School in Laurinburg, NC. He stands 6'1, and weighs 220.